The Thinking Woman’s Guide to Real Magic is a difficult book for me to review. I was drawn to the title and premise, but ultimately found the first to be misleading and the second to be far more exciting in blurb format than in reality. To begin with the good, Emily Croy Barker has developed a world of magic that is filled with promise. The magicians – chiefly Aruendiel – are an interesting lot and I’d have loved to have delved deeper into their characters. Unfortunately, there was a lot of missed opportunity in The Thinking Woman’s Guide to Real Magic. Our guide throughout the story is Nora, the titular “thinking woman” who really doesn’t use her brain as much as she ought to. Nora is from our world and I believe she’s supposed to be the character we all identify with, but she seems to lack common sense or the ability see anything from a viewpoint other than her own (Annoyed that people in this magical, medieval-type world aren’t as progressive or “enlightened” as you? *Sigh*). I didn’t mind this in the beginning of the book, when she was enchanted by the story’s villain, but I expected Nora to grow as a character in the ten months or so she was Aruendiel’s world. That she was so easily fooled by the villain near the end of the story pained me to no end. Aside from learning a few spells and parlor tricks, Nora really didn’t seem to learn much on her journey. I could forgive Nora’s flaws if The Thinking Woman’s Guide to Real Magic were at least interesting. Sadly, we spend most of the book’s nearly 600 pages following Nora as she does her chores and follows Aruendiel about. There seems to be no real point to much of this, and the book could have been halved without losing anything. Near the end things do pick up, but much to my dismay, the book ends with a cliffhanger of sorts. Not an interesting cliffhanger, mind you, simply one that made me double-check my book because I thought I was missing pages. None of the major plot points are resolved, and since we spend so much time watching paint dry (figuratively speaking) I felt extremely cheated as a reader. 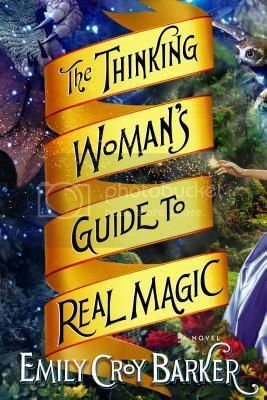 The Thinking Woman’s Guide to Real Magic isn’t an entirely bad story, but it is one that suffers from a frustratingly obtuse heroine and a lack of any real direction. I give you credit for sticking with a 600 page book when you weren't really feeling it! And then to end on an unsatisfying cliffhanger is just adding insult to injury.